Breaking News About Ethiopian politics!!! 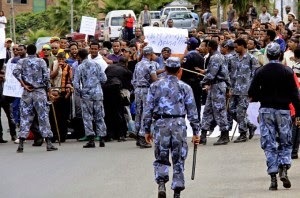 : ETHIOPIA :Dozens of Ethinic oromo students protesters killed! ETHIOPIA :Dozens of Ethinic oromo students protesters killed! At least a dozen protesters have been killed and many others wounded as students in Ethiopia's populous Oromia region clashed with military forces on Wednesday. Student protests began earlier this month in response to plans by Addis Ababa City Administration which is expected to significantly expand the city's territorial jurisdiction. Thousands of Oromo students at nine universities in Oromia have rallied in the last ten days opposing the plan, which they say would displace Oromo farmers and undermine their state's constitutionally protected "special interests." Oromo students at Jimma, Haromaya, Ambo, Wollega, Bule Hora, Madawalabu, Metu, Adama and Dire Dawa universities have turned out in droves denouncing the plan. At least 20 students were killed in Ambo while three others were shot dead at Madawalabu University on Wednesday, according to eyewitnesses. Unknown number of wounded protesters were being treated at local hospitals. The Ethiopian capital falls within the Oromia state, the largest of Ethiopia's nine ethnic-based administrative regions, and also serves as its capital. The country's constitution stipulates the state's special interest in the city — providing for utilization of resources, service provision and joint administration matters. Protesters say the city's latest master plan undermines these interests.